December 25th is creeping up and I'm still trying to get into the holiday spirit around the apartment. I had been keeping a mental note of all the Christmas DIYs I wanted to create this year, but seeing the abundance of xmas decor at every single store has me SO tempted to just buy, buy, buy! Guess that's exactly what they meant when they said, "'tis the season to be broke". 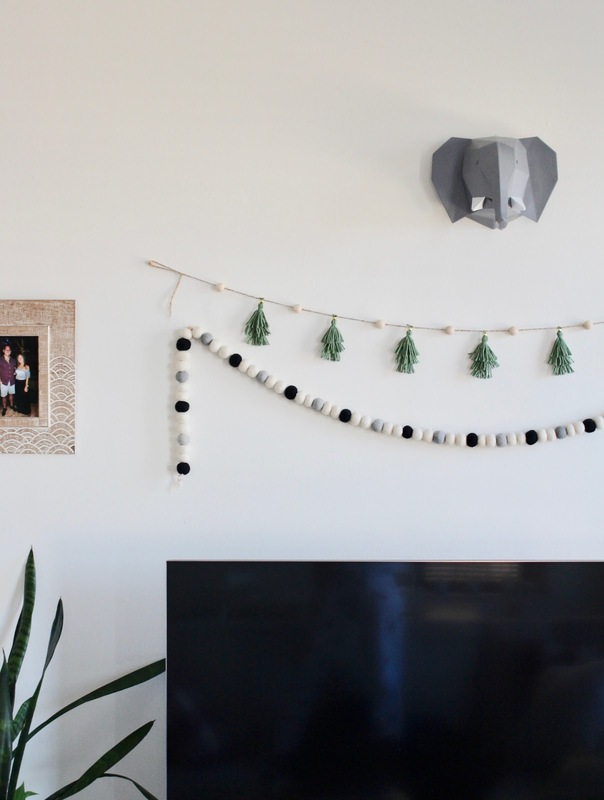 Luckily I did manage to whip up a super cute DIY banner garland for the most wonderful time of the year. 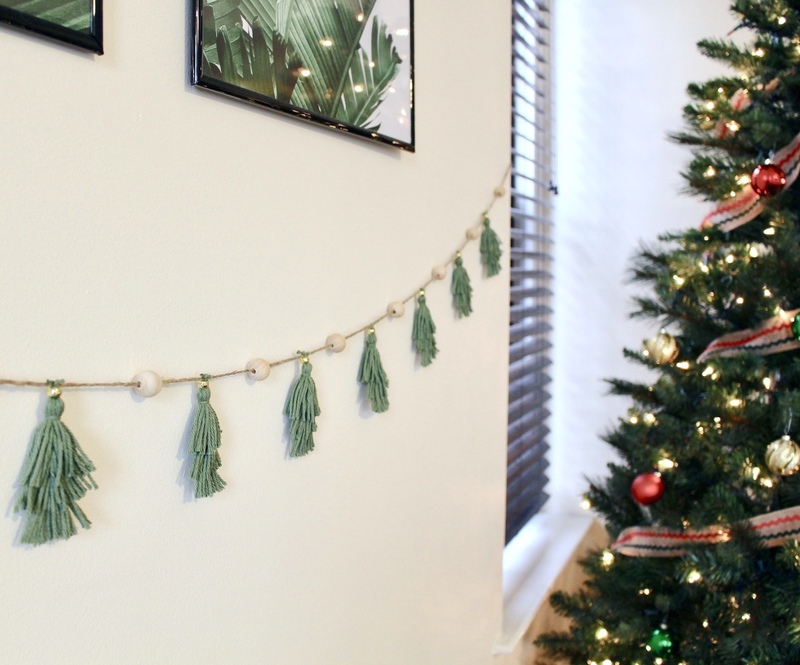 This simple idea stemmed from Christmas trees made out of layered tassels, so you can always ditch the jute and turn them into ornaments, keychains, or gift toppers! First things first. 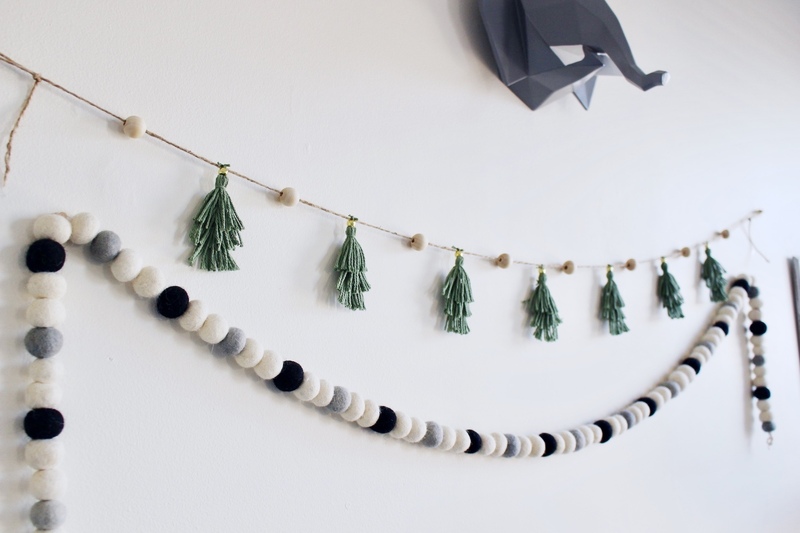 Decide how many little Christmas trees you'd like hanging from your garland, and multiply that by 3; that's how many tassels you'll need to make. Don't get overwhelmed by that number, I promise to give you a super easy tutorial for DIY tassels. Pop on an episode of Vanderpump Rules and as soon as you get the hang of how simple it is to create tassels, you'll finish all of them before the episode is over! For reference: my garland has 7 Christmas Trees; 21 tassels needed. With leftover cardboard, cut out a 2x2-inch square. If you'd like longer Christmas trees, feel free to bump up the size of the square. Cut two small slits on one edge of the square, as seen in above photo. 1. Cut a 4-inch piece of yarn and line it up along the top edge of the square. 2. With the rest of your yarn, secure the end into the left cardboard slot. 3. While holding the 4-inch piece along the top edge of the square, start wrapping the rest of the yarn around the back and front of cardboard. For reference: I wrapped 10 times. For thicker tassels, wrap until desired thickness. 4. Secure yarn in the right cardboard slot, and trim. 5. Double knot the 4-inch piece of yarn tightly. 6. Carefully cut the wrapped strings on the opposite side. Remove the secured ends from the slots. 7. To hide the knot, flip the tassel so that the top bends in the opposite direction. Cut a new 4-inch piece of yarn. 8. 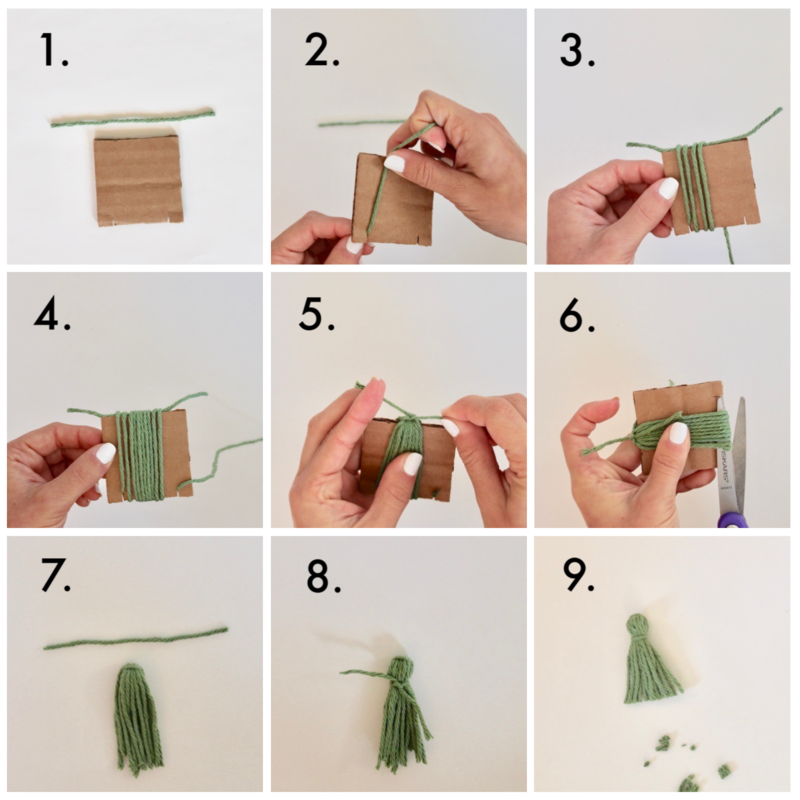 Wrap piece of yarn around tassel, and double knot to create a "head". 9. 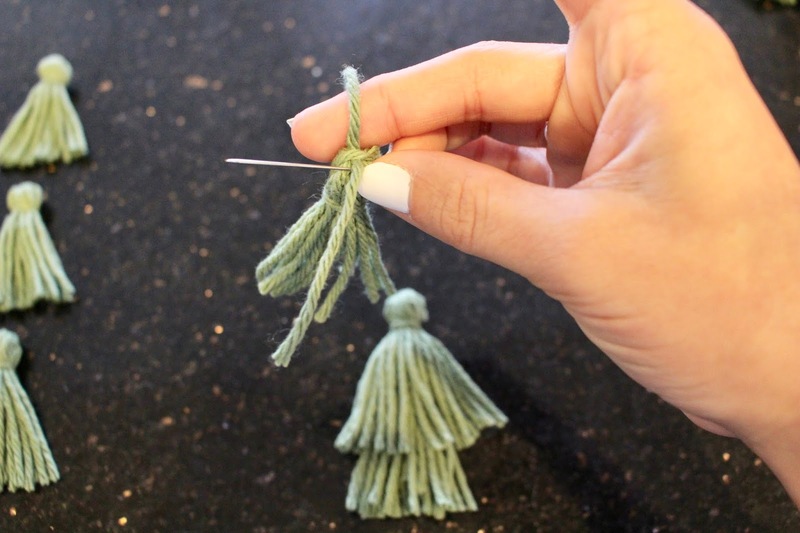 Turn tassel over and trim ends for a more even, cleaner tassel! 10. Repeat until all tassels are completed. 1. Separate your tassels into sets of threes. 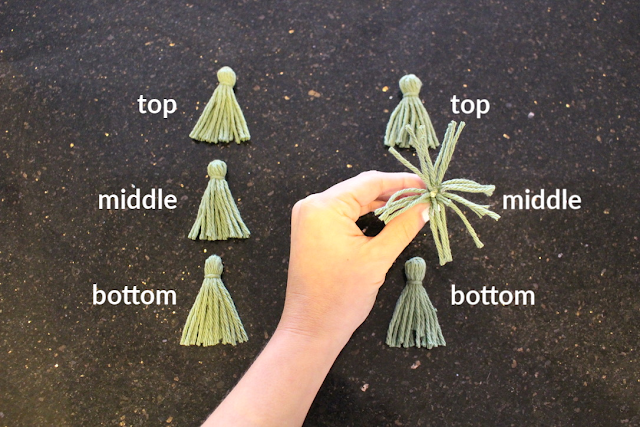 It helps to line them up vertically to better visualize which tassel will be the top, middle, and bottom layer of your Christmas trees. 2. Flip the 'middle' tassel upside down and add a tiny amount of hot glue to the center of the inside, as seen below. 3. Apply the head of the 'bottom' tassel to the glue, and adjust the fringes so that they hide the head underneath. 4. Using a safety pin or sewing needle, loosen a string from the head of the 'top' tassel. You'll need to loosen the same string on both front and back of tassel, as seen below so that it can be tied to the garland. 5. Repeat step 2 and 3, this time applying hot glue to the inside center of the 'top' tassel. Add the head of the 'middle' tassel to the glue. 5. Thread a gold bead through the top two loose strings. This will act as the gold star or Christmas tree topper! 6. Repeat until all Christmas trees are complete. 7. 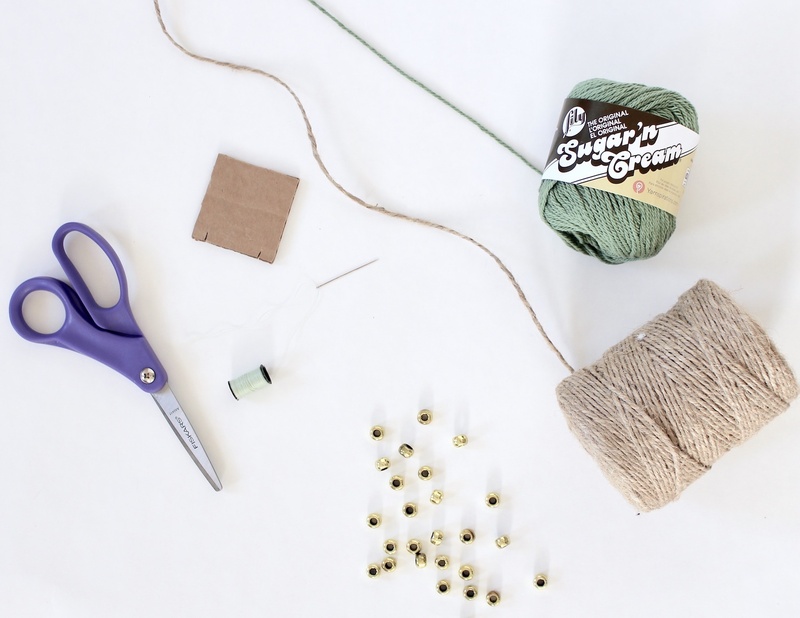 Cut jute, or garland string, to desired length. 8. If alternating trees and 5mm wooden beads as I did, optional tip: fold jute string in half to determine the center point. Double knot the top tassel strings to secure it to the garland, then thread wooden beads to each end. 9. Repeat to add each Christmas tree until your garland is complete, and trim strings if needed. I hope you enjoyed this tutorial! If you decide to give it a try, don't forget to tag @thebeetique so that I can see how you did! 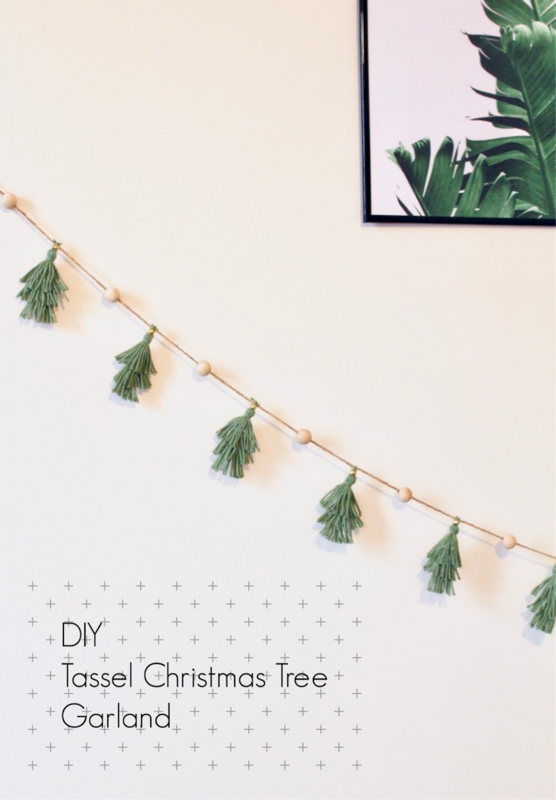 1 comment on "DIY Tassel Christmas Tree Garland"
It is very good article. Thank you for sharing.